You do not have to be a sports buff to enjoy a good sports biopic. There is something about the blood, sweat, tears and toil poured into any sporting arena that holds out an impossibly irresistible allure for filmmakers and audiences – perhaps because the boxing ring, the wrestling mat, tennis courts and running tracks mirror all life’s struggles off the field within that limited physical space, even when you know nothing of the technicalities involved. Now imagine that starting block advantage combined with a deeply inspiring true saga of the sort on which Soorma is based. Director Shaad Ali’s new film is about the life of Indian hockey player and Arjuna awardee Sandeep Singh, whose rise to the international circuit was interrupted by a freak accident. Singh’s incredible grit led to his recovery from a potentially career-ending injury. He went on to lead India to victory in the Sultan Azlan Shah Cup in Malaysia in 2009, and was part of the Indian team that qualified for the Olympics in 2012 after a drought. As commercial Bollywood veterans might point out, iss kahaani main drama hai, emotion hai, romance hai, naach-gaana hai aur twist bhi (this story has drama, emotion, romance, song ‘n’ dance and a twist) – in short, all the ingredients that tend to please conventional audiences. And in the first half, Ali (who earlier directed Saathiya and Bunty Aur Babli) and his co-writers Suyash Trivedi and Siva Ananth mine each of these elements to come up with an entertaining mix. Sandeep a.k.a. Sunny, as they portray him, is a rebellious kid who abandons hockey out of anger towards a violent, bullying coach but returns to it nine years later – as a still rebellious somewhat immature adult – to impress a pretty girl. Harpreet is a gifted hockey player who aspires to represent India in the game. As their romance and Sunny’s training progress, he evolves as an athlete but is jolted out of his immaturity as a human being only by that life-altering calamity. So far so good, pre-interval. Diljit Dosanjh is cute as Sunny. The popular singer-turned-actor manages to capture the mischief and silliness of a young man who is fixated on the woman he loves and simultaneously unaware of his rare talent. Taapsee Pannu’s athletic frame is perfectly suited to her role as Harpreet, and she occasionally manages to get to the heart of her character’s passion for her game and affection for Sunny although she is written with far less depth than the male protagonist. Before the break, the scenes of their training are convincing and the matches Sunny plays, thanks to Chirantan Das’ clever camerawork and Farooq Hundekar’s keen editing, are utterly gripping. As someone who does not care a fig about most sport, I found myself cheering each time Sunny scored a goal and willing him to win. This, to my mind, is the ultimate test for the depiction of any sport in cinema. Shankar Ehsaan Loy’s songs – though not on a par with their brilliant soundtrack for Meghna Gulzar’s Raazi earlier this year – fit well into Soorma. I particularly enjoyed the unapologetic Bollywoodness in the way the music directors and Ali use the hook “padhariye padhariye” in a musical interlude to celebrate Sunny’s early successes. Against this backdrop, Soorma also brings us the heartwarming bond Sunny shares with his elder brother Bikramjeet Singh (Angad Bedi) who is a hockey player and his mentor. Bedi is really good here, as he always is, but I am tired of watching him only in supporting roles, when all I can think of each time I see him is: when on earth will his industry realise that this man is leading man material? This is an actor who fills the screen with his presence, is handsome, hot and can act till kingdom come as we know from Pink, Dear Zindagi and even F.A.L.T.U. What are you waiting for, Bollywood? Back to this film, the hockey matches continue to be well shot and the gentlemen’s acting continues to be effective even in the second half, but the film itself becomes far less exciting for two very obvious reasons. First, it completely fails during Sunny’s recovery from his injury. And second, the portrayal of the Sunny-Harpreet relationship is oddly awkward, as though the writing team was trying to be clever and philosophical about the whole affair, but could not quite get it. What makes the real Sandeep Singh’s journey so unique is the manner in which he managed to physically and mentally lift himself up from an incapacitating disability. Yet for some reason, instead of entering his mind through that part of the film, Ali & Co decide to step back and observe him completely from the outside. So from a distance we watch hospital processes playing out as a song plays in the background, but we do not get an insight into Sunny’s internal struggles during those passages – unlike the preceding well-handled scenes when he first realises that his career may possibly have been destroyed by a casual but cruel turn of events. The path to his rehabilitation centre is immersive. From the moment he gets there though, Soorma becomes superficial. To make matters worse, Harpreet in the second half suddenly becomes a spare wheel in Sunny’s tale, with motivations that come across as flimsy and somewhat stupid. The result is that the excitement is lost and the narrative becomes insipid. Sunny’s own motivations also become pretentiously lofty when he returns to hockey. Initially he played for Harpreet, then to win over her family, and finally out of commitment to India. At no point is he shown playing out of unbridled enthusiasm for hockey. While there is something very endearing about the goal of “India khelna hai” (I want to play for India) that is almost a refrain in Soorma, and it is obvious from interviews with many great sportspersons that playing for the country is a massive high, it is hard to believe that that alone could push an individual to unprecedented heights if love of the sport itself does not drive them, irrespective of what their additional compulsions may be. Other sports films by Bollywood have understood that well. The biopics Bhaag Milkha Bhaag and Mary Kom did. Anurag Kashyap’s fantastic Mukkabaaz did too, just this year. And with a vastly different tale to tell, Tigmanshu Dhulia’s excellent Paan Singh Tomar strode into the heart and mind of its hero to ensure that his journey, joy and pain become ours as much as his. 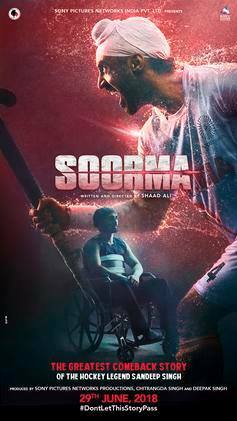 Soorma (which means “warrior”) does that to a certain extent, but just when it needed to give us an inside view of Sandeep Singh’s life, it inexplicably decides to become an aloof observer. Since I did not know about this remarkable man before watching this film (sorry, sports buffs, but that is the truth), I am glad I did. But it is a pity that Ali and his team manage to draw us into the pages of his world only up to a point but mess up the most important chapter. Diljit Dosanjh and Angad Bedi are always worth watching, but the film should have been a lot more than what it ends up being.